Showing 1 - 1 of 1 Products for Dual Battery Solenoid Relay. Our starter solenoids contain heavy-duty copper contacts that reduce the effect of arcing and extend solenoid life. 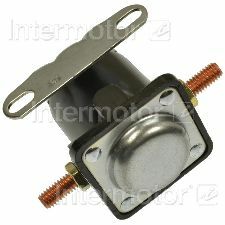 Our starter solenoids have more pure copper windings than found on most vehicles to create a stronger magnetic field. Our polyester-insulated magnet wire, cadmium-plated copper discs and solid contact bolts reduce voltage drop and deliver full battery power to the starter while providing greater protection against electrical overload. Pure copper battery terminal studs reduce resistance to permit higher current flow, even in the hottest environments, for better performance. We understand and expect the demand for quality, our starting and charging system products feature high grade materials for extended service life. As a global manufacturer of original equipment ignition products, we maintain complete quality control throughout the manufacturing process from componentry to finished product.